Penguin, Panda or Hummingbird Google algorithms got you DOWN? Search engine optimization (SEO) is the process of promoting a business online to achieve better Natural (Organic) Search Engine rankings (FREE listings) for relevant, targeted keyphrases and it refers to optimizing the HTML and content of a website for both search engines and visitors in order to attain higher SERPs (Search Engine Result Pages) and PageRank than competing web sites. Search engine optimization (SEO) will increase qualified traffic and generate more customer enquiries from the higher traffic. 85% of all traffic comes from search engines. Search Engine Optimization (SEO) isn't the end-all-be-all. You have to have a well rounded, smart, long term marketing plan for your web site that includes certain basics for you to rise in the natural organic rankings. Have realistic expectations and look at your Web marketing plan as a long term effort. I knew search engine optimization was important, but I had no idea the difference it would make for my business. Ron Hilbert of Confluence Internet Services did a fantastic job updating my website and the SEO (Search Engine Optimization) has greatly increased my web traffic as well as my internet search engine ranking. I am getting 3 times the orders after the SEO work. Ron is very knowledgeable and was very patient in explaining everything to me. His work far exceeded what I thought my results might be. More traffic means more business and my investment spent doing this will definitely pay for itself in no time. Thanks so much for all your great work Ron! I love it! Marketing and Search Engine Optimization (SEO) go hand in hand for getting new clients. You must get them to your web site and once they are there you must tell them what you do, why you are different and better than your competition, and why they should go with you. We can help your web site grow and become "noticed" on the Internet. We will work with you at your pace, helping you understand what we are doing, and let you have "control" of your web site. Now that the company web site has become the hub of marketing you will get a high return on your SEO (Search Engine Optimization) marketing investment. NO monthly payments! Search Engine Optimization (SEO) should be reviewed each quarter and adjusted if necessarry. Many of our clients say they have not changed anything in 2 years and are still ranking high in the search engines because we do it right the first time. Search Engines take 1 to 6 weeks to up-date their database, so if you make monthly changes they may not even get into the search engines database to effect your rankings. Monthly payments for SEO (Search Engine Optimization) is a waste of your money!!! Better Google crawl coverage and fresher search results to help people find more of your web pages. A smarter crawl because you can tell Google when a page was last modified or how frequently your page changes. Detailed reports to learn more about how Google directs traffic to your site and how the Googlebot sees your pages. Consumers find Web Sites through Search Engines (Google 83.33%, Yahoo 7.28%, Bing 3.52%, Baidu 3.46%, AOL 0.65%, ASK 0.61%) etc. You are awesome. I think back on how nervous I was way back in the Fall, I feel like a big dummy! You are fantastic! Thanks to your SEO work on the website, I was contacted by Animal Planet. They did a TV show about me. They were here for 8 hours shooting tape. It was cool. So, Ron, without you none of this would be possible; the TV show, my new facility and all of the press coverage. The root of all success in search engine marketing begins with "keywords". Period. Get them wrong and virtually everything about your online endeavor will fail. Only by targeting the right keywords can you expect to ride that exhilarating magic carpet to online prosperity. Having the best looking site won't give your business any benefit if it can't be found. Registering your URL with all the major search engines won't give your pages a decent shot at appearing on the coveted "page one" of the search engine results unless it is backed up with a targeted search engine optimization (SEO) and linking campaign. We go through your HTML pages and "optimize" what will get you indexed properly in the Search Engines. We adjust the components that the Search Engines are looking for such as keyword density, links, frequency and proximity in the body text. Words in and around links, body text content, headlines, page titles and much more. Your pages should be "optimized" for consumers. When consumers find what they want they are not tempted to leave for other things. Instead, your site is more "sticky" - our strategic optimization solution boost the site's viewing time and generate increased levels of Web traffic, targeted advertising revenue, and e-commerce dollars. I have been amazed at the results that I have received in such a short period of time. My web site was developed by another company. Confluence Internet Service looked over the pages making adjustments with keywords for Search Engine Optimization. This was a new site so I figured it would be a couple of months before I got high page ranking. It almost seems like it's been overnight. Ron's knowledge of Search Engine Optimization has been the difference. Ron has been great to work with, I feel the service I get is personal. All questions I have asked have been answered so I can understand them. This has been a very good experience for me. I would highly recommend Confluence Internet Services. Once Again Ron Thank You! 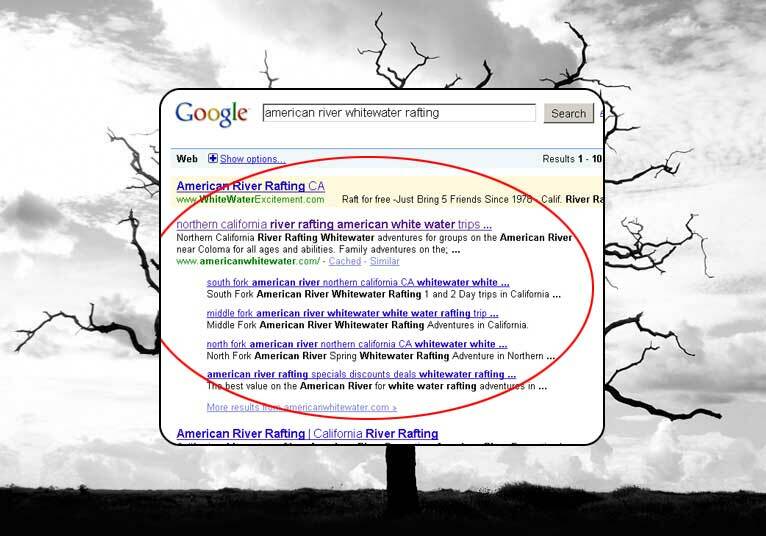 "I just did a search on Google on Colorado Whitewater Rafting and we came up number one. You have done a great job getting my site ranked higher in the search engines. Thank you for all your work!" Guarantees are worthless in search engine positioning because outcomes are always unpredictable and algorithms are ever changing. New submissions are always being added to databases, changing rankings continuously. Bottom line: technicians simply cannot control search engines. There is no Guarantee of placement or the time it will take to get listed. Most Search Engines take 1 to 6 weeks, some longer. Search engine positioning requires trial and error, and success is ephemeral. Today's top listings will change tomorrow; sometimes, listings change on an hourly basis. Maintaining positioning requires constant monitoring and tweaking. It can't be guaranteed, and results aren't permanent once achieved. New algorithms are being introduced to factor site traffic into the formula for ranking. PageRank Explained by Google: PageRank relies on the uniquely democratic nature of the web by using its vast link structure as an indicator of an individual page's value. In essence, Google interprets a link from page A to page B as a vote, by page A, for page B. But, Google looks at more than the sheer volume of votes, or links a page receives; it also analyzes the page that casts the vote. Votes cast by pages that are themselves "important" weigh more heavily and help to make other pages "important." Important, high-quality sites receive a higher PageRank, which Google remembers each time it conducts a search. Of course, important pages mean nothing to you if they don't match your query. So, Google combines PageRank with sophisticated text-matching techniques to find pages that are both important and relevant to your search. Google goes far beyond the number of times a term appears on a page and examines all aspects of the page's content (and the content of the pages linking to it) to determine if it's a good match for your query.